Your toilet is one of the most used fixtures in your home. That's why when it starts to malfunction it can cause a real problem. If you have a toilet that seems to constantly cause issues such as clogging, running continuously, or it lacks flushing power, the team at Harry Clark can help. We can diagnose and repair any issues you are facing with your toilets - just give us a call! 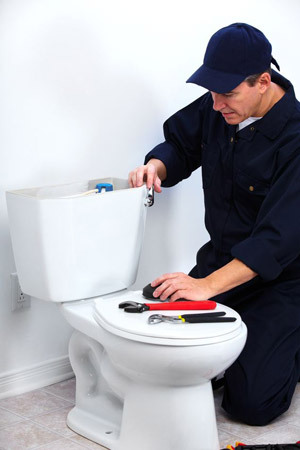 When it comes to repairing your toilet, there are many issues that can cause your toilet to malfunction. Leaky Toilet - When you are having leaking issues with your toilet, it could be caused by any of the small moving parts your toilet is made of. Many of these parts need to be replaced with usage over time. Flapper valves, fill valves, and other tank parts can all wear out and cause toilet leaks that aren't clearly visible to the naked eye. Running Toilet - After flushing, and the toilet bowl is full, your toilet should stop running. If your toilet continues to run often means has internal leaks, meaning that water is being dumped into the overflow and being wasted. Running toilets can be the result of a corroded overflow pipe, worn out flush valve assembly, or a broken flapper valve. Clogged Toilets- Being one of the most common plumbing problems, homeowners reach for the trusty plunger to unclog their toilets. This may work for minor clogs, but if you are unable to unclog your toilet with the help of a plunger, or it is a recurring problem, you may need professional help to unclog your toilet. When it comes to fixing issues with your toilet, you can rely on the team at Harry Clark Plumbing and Heating Inc. We provide our plumbing and toilet repair services throughout Oakland, Berkeley, CA, and the surrounding areas. Contact us to schedule service today!